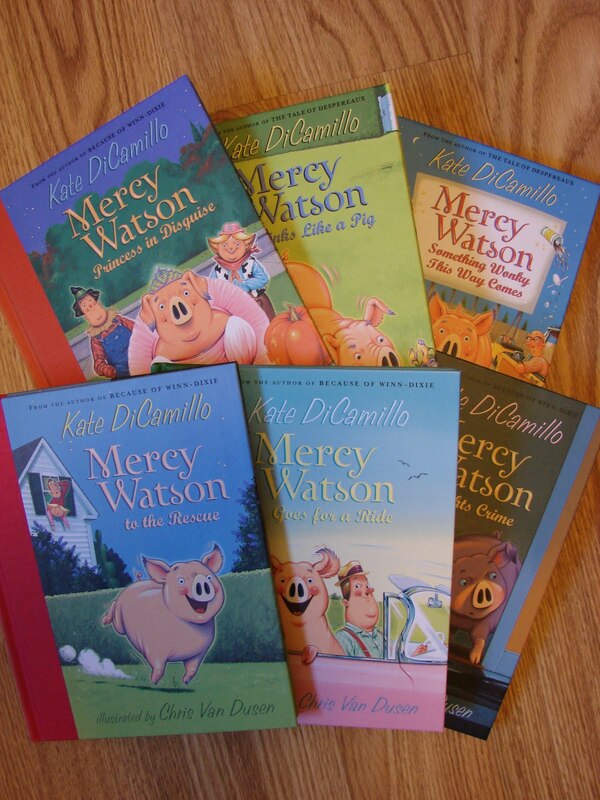 In keeping with my Kate DiCamillo theme this week, I want to review her Mercy Watson series. Kate DiCamillo, author of Newbery Honor Winner Because of Winn-Dixie, and Newbery Winner of The Tale of Despereaux also wrote this enchanting chapter book series for young readers ages 6-8. 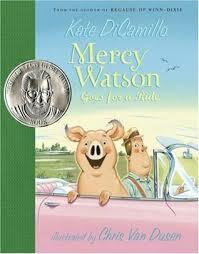 The second book of the series, Mercy Watson Goes for a Ride was the winner of the 2007 Theodore Seuss Geisel Award. I’m glad I waited until I had all six books to read at once. Although you don’t necessarily have to read them in order, I found it to be more fun to read like that because Kate DiCamillo builds on each character in each subsequent book. Of course there is Mercy Percy, the butter loving – adventure loving pig, and Mr. and Mrs. Watson who would do anything in the world for their darling, dear, porcine wonder. In the first book we are introduced to the Lincoln sisters, Eugenia and Baby, the Watson’s elderly yin and yang neighbors. Eugenia has an opinion on everything, and in her opinion pigs should not live in houses. She spends the next five books trying to convince everyone that her opinion is correct. And then there’s Baby, who secretly likes Mercy Watson even though she always agrees with her sister Eugenia… it’s just easier that way. Throughout the series we meet Ned and Lorenzo, the fire fighters who are called out for every crisis; Officer Tomilello who has the quirky habit of asking and answering his own questions out loud; Leroy Ninker, the little thief who really wants to be a cowboy and later becomes the reformed conession man at the drive-in theater who still really wants to be a cowboy; Frank and Stella, the neighborhood children who befriend Mercy; and Animal Control Officer Francine Poulet whose nose looks remarkably like a chicken’s beak. Kate DiCamillo expertly weaves these characters in and out of the series always putting Mercy Watson’s love of butter at the center of her conflict and in every resolution. How could one not adore a character who unabashedly follows her dream into wacky wonky misadventures? Leave it to Chris Van Dusen to paint the story pictures so vividly on each page. Each character’s personality and motivation is captured in their faces and their body language. Chris Van Dusen extraordinary illustrations will leave you begging for more. You might be interested in reading some of his other works as well. Look for the Mr. Magee series of early readers and several other titles including The Circus Ship which looks amazing and is on my reading list!